Samsung Galaxy Star Pro smartphone was launched in October 2013. The phone comes with a 4.00-inch touchscreen display with a resolution of 480x800 pixels. Samsung Galaxy Star Pro is powered by a 1GHz processor. It comes with 512MB of RAM. The Samsung Galaxy Star Pro runs Android 4.1 and is powered by a 1,500mAh removable battery. As far as the cameras are concerned, the Samsung Galaxy Star Pro on the rear packs 2-megapixel camera. Samsung Galaxy Star Pro based on Android 4.1 and packs 4GB of inbuilt storage that can be expanded via microSD card (up to 32GB). 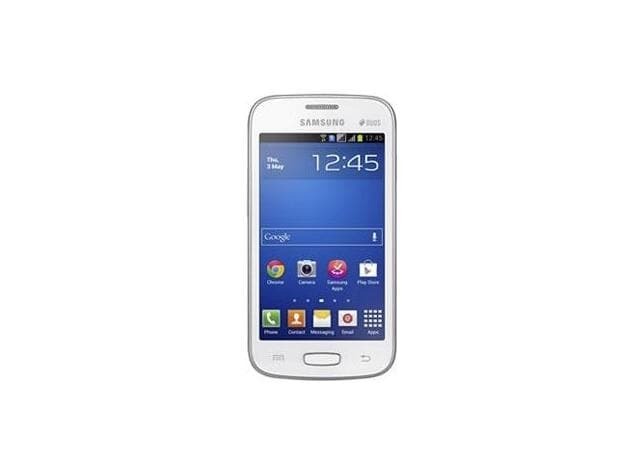 The Samsung Galaxy Star Pro is a dual-SIM (GSM and GSM) smartphone that accepts Regularsmartphone. Connectivity options on the Samsung Galaxy Star Pro include Wi-Fi 802.11 b/g/n and FM radio. Sensors on the phone include accelerometer. The Samsung Galaxy Star Pro measures 121.20 x 62.70 x 10.60mm (height x width x thickness) and weighs 121.00 grams. It was launched in White colour. As of 23rd April 2019, Samsung Galaxy Star Pro price in India starts at Rs. 4,199. "233 PPI DISPLAY" makes it a winner. 1. UI >> Jelly bean (Swipe keyboard, Google now with voice command,Google Chrome etc ).. Awesome. No lag at all.. ( Please don't spoil the beauty of the phone by using Go launchers ) 2. RAM >> 512MB DEBATE (usable:450).. Feels a bit less, but you'll never cross 400MB so don't worry. 3. CPU , GPU >> Pretty Awesome.. You wont have a problem. 4. GAMES : ""To start a game,you need a CPU.. For good Fps, you need a GPU" It will RUN EVERY SINGLE GAME ON PLAY STORE because of the good CPU in it.. but will lag due to poor GPU. Example : 1.Subway surfer 2.Asphalt 8 3.Temple run 5. WIFI , 2G: Wifi works flawless and the 2G internet is definitely good at good signal strength. 6.Camera: 2MP, Megapixel is the measure of how large can you get the pic printed on the paper without distorting it. Whats matters is how good the sensor is. 7. Battery: This is the most debated point of the reviews. If you fall in the age group of (15-25), It will last a day. If you are in thirties it can go on for 2days without a problem. What is it Missing ?? 3G, Front Camera, GPS, Proximity Sensor. Well these are the only things which require costly internet packs, and those who can afford that, won't go for a 6000bucks phone so stop complaining. 2G with Edge is Fast enough for everyone on the go, and anyways it has WIFI for faster speeds. Proximity Sensor : You wont miss that for sure, because when on a call, the phone locks itself so beautifully that you have no chance of pressing any buttons accidently with your ears. For this price, this is a steal deal.. You cant get better. The thing you will love is the "233ppi Display", "Jelly bean interface", "Voice Commands" etc.. For people who wants a budget phone with 3G: Go for "Samsung Galaxy Young S6312".. It has the same exact features +768 RAM + 3G + GPS + Proximity Sensor + better GPU.. But it lacks Battery and the beauty of a 4inch phone coz it has only 3.5 Inch poor display. this is the poor phone i ever seen ....it lot of disadvantages and the gaming performance is not look good ..